The weight of my last portable oscilloscope was more than 10 kg. 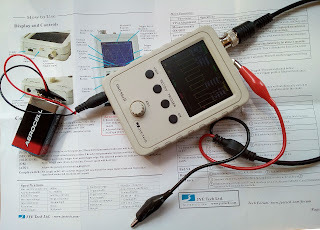 Now i bought and build this digital handheld oscilloscope DIY Kit. It is not complete fair to compare my at least 20 year older "portable one" to this device as they have some different options. But this less than 20 euro device that can be used for simple projects is really portable and my older "portable" scope weighs more than 50 times. End march 2017 i payed € 18,83 , no shipping fee. Current price (may2017) at same Aliexpress shop € 20,48 and € 3,79 shipping fee to the Netherlands. If the total price exceeds 22 Euro this can result in additional taxes and handling fee. Another shop now asks € 18,90 without shipping costs. 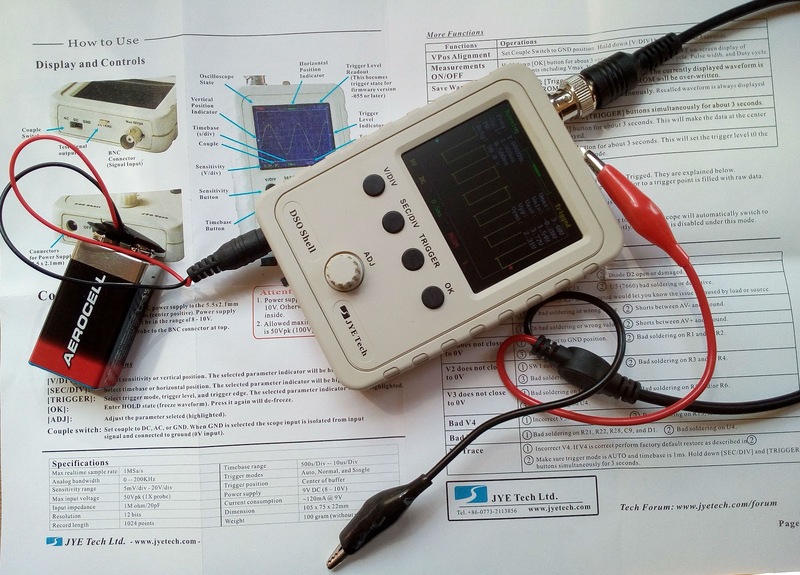 This mini digital oscilloscope can be ordered in different versions. When searching for "Digital Oscilloscope" on AliExpress you can find different versions. 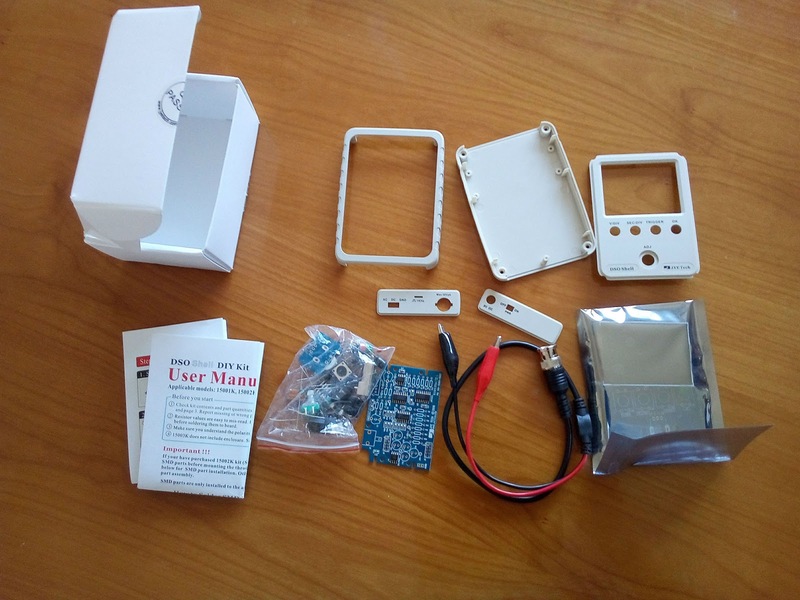 I selected this one (DSO 150 / JYE Teck ) as it has a nice case / enclosure, the SMD components are already soldered and the price including shipping is less than €22,00. The construction was easy with the two double sided pages manual The photo's in the instruction are a bit confusing as they not exactly show the components that are already on the PCB when following the text chronology. Some people recorded assembly instructions and did put it on youtube. - You need to test the circuit first with only the SMD components installed (the way it arrived). After the test you need to remove one SMD resistor! With the SMD resistor installed you do not need the power switch to turn the device on. So it was still necessary to do some work with a small SMD component. - After adding some components you need to measure voltages at some points. 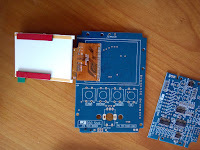 - The device consist of two main PCBs , an analog and a digital part (and a small PCB for the rotary encoder). They can be mechanically connected two different ways (with the same electronic connections). One way the PCBs are close connected to fit in the box and another way where you can easy access components to calibrate the instrument with a 1kHz square wave signal. (Pin next to the BNC connector. This pin is also available it the box is closed.). The most difficult part for me was the calibration; you need to know how to operate this oscilloscope. When i assembled this device i was in the beginning of the learning curve.On the website of the manufacturer important info about this device (schematic, manual, tips ) can be found including this important note: "It is assumed that users have adaquate soldering skills and troubleshooting skills to assemble the DSO Shell kits. Buyers are advised that due to skills of user is involved in assembly it is not guaranteed every kit will end up being a working device.But we will make as much efforts as we can to approach that goal." Sine, Square and Triangle function signal generator . - There is no real battery holder for my 9 volt battery. - The device only has a timebase and one channel. It is not an oscilloscope with X and Y input.